This does reveal that any student using electronics has a learning disability. That is a loss of privacy for those students, which also occurs when they are given more time to complete a test. Those negatives must be weighed against the learning losses of other students when laptops are used in class. So students with disabilities have to out themselves to everyone, which we know discourages self-reporting and thus accessing needed accommodations, but hey…better than other students suffering “learning loss” if laptops were allowed to run amok in the lecture hall, right? is about the assumptions instructors make about students. It is about the narratives educators construct about learning. All too often, underlying discussions of appropriate student behavior and traditional best practices are narrow visions of students’ abilities and classroom praxis. Seeing a study body as an undifferentiated group leads to strict rules and single solutions. This whole laptop debate is sorely lacking the voices of current students. The whole argument for laptop bans has taken on a “we know what’s best for you” character, which might be OK when I’m trying to get my son to eat something besides Go-Gurt for dinner, but fails miserably as an intellectual position about teaching and learning. This is a point made repeatedly by those of us who push back against these calls for laptop bans: effective teaching and learning requires nuance and flexibility, not rigid bans. In addition to my own contribution to the debate, excellent scholars such as Jim Lang and Jeff McClurken argue far more eloquently than I did that unilateral technology bans such as those regularly offered in the op-ed pages of the New York Times aren’t the answer to improving teaching and learning in higher education. My intent here is not to repeat these arguments, but rather further unpack what I see as the larger principles that inform these calls for laptop bans, and to interrogate the assumptions upon which those principles rest. The arguments made by Dynarksi and her predecessors rest upon research that, in their view, clearly demonstrates that laptops are a distraction and handwritten notes are better for learning. But when we look at the studies they cite–most recently the Princeton and UCLA experiments Dynarski alludes to–it’s clear that they define “learning” in very specific, and I would suggest problematic, ways. These studies measured students’ retention of content presented to them in TED Talks. Yes, you read that correctly. Students were asked, in one study, to either take handwritten notes or notes on a laptop (disconnected from the internet) as they watched a TED talk. Then, after 30 minutes of distraction-filled interlude, they were tested on how much they retained from the talk, both facts and larger concepts. In the other study, students also watched TED talks, and were told to take notes as they normally would in a lecture. Both studies concluded that those who handwrote their notes did better retaining the “concepts” of the videos. This is apparently enough for some to argue that laptop bans will help learning in both K-12 and college, but I have lots of questions. Can we claim differentiated learning results after a mere half hour? Do TED talks reflect the typical teaching and learning experiences encountered by students? If the laptops weren’t connected to the internet, aren’t we just measuring typing versus writing notes, as opposed to the effects of distraction? But most importantly, why are we defining “learning” as merely retention of content from slickly-produced bite-sized chunks of lecture? If that’s what we’re going to call “learning,” let’s just hand students a few notebooks, some pens, and four years’ worth of YouTube videos and call it done. Neither the Princeton or UCLA studies, nor any of the other research I’ve seen cited in support of previous calls for laptop bans, addresses the most important question of all: pedagogy. If a student is distracted while watching a 20-minute talk about Power Poses, is it because they’re writing notes on a laptop or because they’re no more than a passive recipient of material that may or may not have a context and purpose for their learning? If students are not doing well in a course, is it because they’ve opened up Facebook on their laptop, or because they’re one of 500 people crammed into a cavernous auditorium being asked to follow a fifty-minute monologue on Say’s Law and Classical Economics? All of the calls for laptop bans take the lecture class as their implicit norm, and it begs the question: why aren’t you testing for the effects of long-term lecture delivery on student learning instead of what modality their notes are produced in? If we follow the logic of these sweeping calls for banning technology in the classroom, we’re left with something like this: laptops cause distractions, so better to require handwritten notes in order to mitigate any potential device-induced distractions. Yet the same argument can be made for banning the pencil, if doodles are to be interpreted as evidence of distracted students. Where do we stop? Are students to use clay tablets and a stylus to attend to our words via cuneiform? The problem isn’t technology, it’s distraction. And distraction presents itself in a number of ways: opening a web browser in class, staring out the window, doodling, setting your fantasy football lineups–just look at what our colleagues are doing on their devices during the next faculty meeting to see all the potential manifestations. Distraction stems not from some primal need to shop online in the middle of class, but from when students are not a part of the learning experience. When students are not invited to engage in their learning, but are expected to be merely passive recipients of “content,” we are guaranteeing that they will not learn as effectively as they might, and that’s true no matter how many laptops are open in the classroom. Ultimately, it comes down to how we see our students. Do we see them as adults, or at least as capable agents in their own learning? Or do we see them as potential adversaries in need of policing? Do we see them as capable of making their own decisions and learning from those that aren’t necessarily the best ones? Or do we see them as needing regimented policies to keep them on the straight and narrow? Do we teach with eye towards engagement and conversation–even if that conversation is unskillful or cacophonous? Or do we teach while keeping our guard up looking for “disruptions” and being ready to pounce? How do we see our students? More importantly, how would our students answer that question? 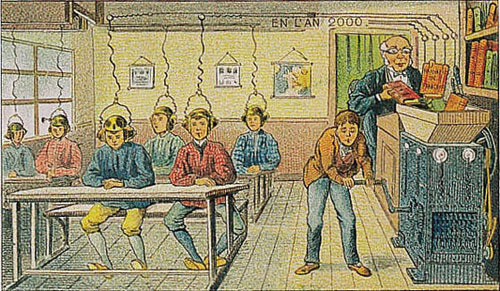 No one is arguing for a wild-west classroom where laptops are blaring and anything goes at any time. What those of us who refuse to jump on the ban-wagon are saying, though, is that going too far in the opposite direction would be equally unhelpful. If there’s an activity or discussion where I want my students to completely focus on the material and each other, then I ask them to put their laptops and tablets away for the moment. If I want to have a classroom environment which fosters constructive engagement, then I invite my students to help me set the expectations for that environment. Nuance and flexibility are key. Our students learn differently, engage with material in different ways, and use diverse techniques to take notes and study. One size most definitely does not fit all. When it comes to the question of technology and learning, we need to be mindful of Abraham Maslow’s observation that if the only tool you have is a hammer, you tend to see every problem as a nail. We need to get past arguing about laptops when we should really be talking about pedagogy, and we need to invite student voices into the discussion. I’d like to see that modeled in the New York Times op-ed pages, instead of sweeping diktats inspired by narrow evidence, but I’m not gonna hold my breath. December 5, 2017 in Kevin Gannon. Pam A. Mueller and Daniel M. Oppenheimer both based in princeton. I’m not happy with their statistical analysis. The effect size is quite small, the standard deviation in the data is significantly larger, and they quote raw Z scores, rather than calculating whether the deviation observed is statistically significant. Given the small size of the study, I think it is unlikely that it is. It’s all about pedagogy. Cramming students into lecture halls is a failure of our universities. Professors that sit or stand and lecture for an entire class period with no opportunity for students to actively use or integrate the content are literally doing nothing to help their students master the content. The problem is not the technology. The problem is in the delivery system. Sorry to say this, but possessing a degree which is research oriented does not make a person capable of teaching effectively. Unfortunately, too many schools are still stuck with a mindset where professors are evaluated on their research and not their teaching.